Rucksacks burning your shoulders, bumpy roads jarring your knees, sweat pouring… That’s one way to explore the tropical paradise of Indonesia. That’s traveling. White sails, blue water, freedom, escape, indulgence… That’s traveling by chartered yacht. 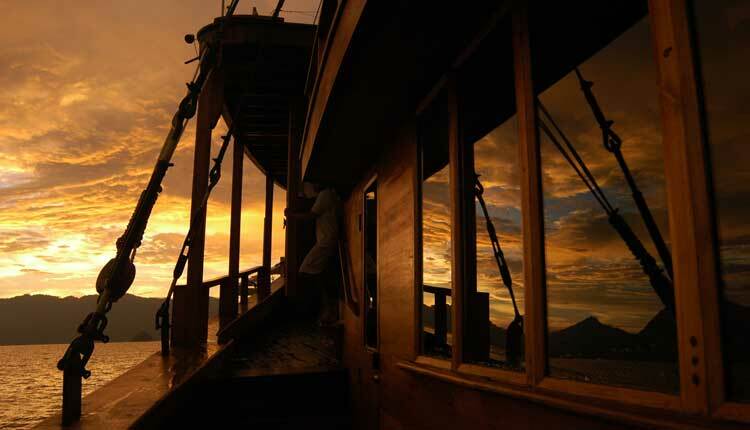 Cruising the stunning Indonesian coast, these amazing vessels take adventure travel to a new level. But even in the exclusive world of the haves and the have-yachts, there aren’t many sailing experiences on planet Earth that match the Silolona. This classic luxury Phinisi schooner is king of the waters – and it’s your chance to unlock the secrets of this incredible corner of the globe in style. With about 13,000 beautiful islands peppered around South-East Asia, Indonesia is the world’s largest archipelago state. You can scuba dive undiscovered coves, cruise deserted inlets, explore islands where no one has ever set foot before and meet extraordinary indigenous tribes. Who won’t eat you. Not cheap, if you’re buying one. Trust us, you’re not. The good news? You don’t have to. While you’re waiting for those damn lottery numbers to finally show, let good people at Black Tomato hire the Silolona exclusively for you and nine friends. Hell, you even arrive in style: the second you land in Bali, a private sea-plane jets you out to the Silolona, touching down on the water alongside the hand-carved wooden ship. The crew crank up the sails and prepare your gourmet meals on demand. You relax like a royal and plan your adventures over the next week. Here’s the thing: what you see and do on your trip is your call. The itinerary is designed entirely by you and the boat’s experts. Use the Silolona as your basecamp for kayaking, water-skiing, fish or grabbing some amazing scuba diving in Raja Ampat. Pick your own pristine, private beach on one of Indonesia’s untouched islands for a picnic. Previously off-limits, the world-renowned Mergui Archipelago is one of the few remaining untouched paradises on earth. Now it’s your playground. But say you want something genuinely unique? Book an Indiana Jones-style hike through New Guinea jungle to meet the Asmat people. Living in a world of dense forest and bamboo bridges, this indigenous tribe of only 70,000 people lives completely unaffected by the modern world and is rarely visited by outsiders. Rock up during one of their traditional ceremonies and you’ll witness a spectacle that’s only been observed by a child’s handful of people in the world. Full body masks. Towering ancestoral totem poles. Elaborate rituals. And after they’ve whipped up a traditional feast, you can even spend a night living in their homes. Don’t worry, they’re not cannibals. They’re just thrilled to see you. The seven-night Silolona experience costs from £5,499 per person (for a group of 10) through Black Tomato. Reclining along the equator, Indonesia brings on a non-stop heatwave of 26-30oC. Forests cover a whopping 60 percent of the country, home to everything from Orangutans to tigers. Read the original article at ShortList.